Mating occurs any time other than during hibernation. Females store sperm and may lay fertile eggs for several years after separation from a male. Tortoise Group and federal and state wildlife agencies strongly discourage allowing captive desert tortoises to mate. We encourage having only one tortoise per household, preferably a male. If you keep multiple desert tortoises, separate the sexes and do not allow them to breed. Besides the stress to the tortoises from fighting and mating, there is no place to put the overabundance of unwanted pet desert tortoises. Tortoises are loners that do just fine by themselves. Also, they have you and often other pets for companionship. Two male tortoises usually fight, two females may or may not get along, and a male and a female will produce babies for a very long time. With 6-26 hatchlings each year, the problem soon becomes overwhelming. The Las Vegas valley has become filled with unwanted tortoises with no place to go. If you have a male and a female, please separate them. Please do not allow your desert tortoises to breed. Reproductive readiness is determined by size rather than age. Females are usually ready when the length of the carapace (upper shell) is about 7- 8″. The number of years for a tortoise to reach this size depends upon how well it eats. A wild tortoise may be 15-20 years old before it breeds, a well-fed pet, half that age. Courtship and mating may occur any time that tortoises are not hibernating. Typically, the male bobs his head at the female and nips at her front legs and the front edges of her shell. This usually makes her stop and pull in her head and limbs. The male then moves around to her rear and mounts. 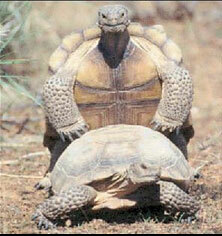 This differs from fighting, where-in tortoises try to flip one another over. Eggs are usually laid from early May to mid-July. Two clutches may be laid several weeks apart. The incubation period is about 90 to 120 days, depending upon the temperature in the nest. Using her hind legs with their long nails, the female digs a nest, a shoe-shaped hole about 4″ deep. The nest is often inside the burrow. Nesting takes several hours. The number of eggs tends to be greater the larger the female. A typical clutch from a wild female is 4-8 eggs, but pet tortoises tend to grow larger and may lay 12 or more. Usual is 6-10. Eggs are hard-shelled, slightly oblong, dull white, and almost the size of ping-pong balls. After laying, the female carefully covers eggs using her hind legs. Sometimes she remains as protection, but she soon walks away and shows no further interest in the nest or the hatchlings. If your tortoise digs several partial nest holes and does not lay eggs, the soil may be too hard or she may be egg-bound. Take her to the vet for X-rays and treatment.